Why Robert Moses Is To Blame For Losing The Brooklyn Dodgers To L.A.
Walter O'Malley's position as a villain in Brooklyn history was sealed from the moment he packed up the Dodgers and moved them to Los Angeles. A new book from Jerald Podair, called City of Dreams, now explores what O'Malley went through in trying to open Dodger Stadium in L.A., and its got plenty of insights into how he tried to stay in Brooklyn, but was ultimately stymied by forces outside of his control. 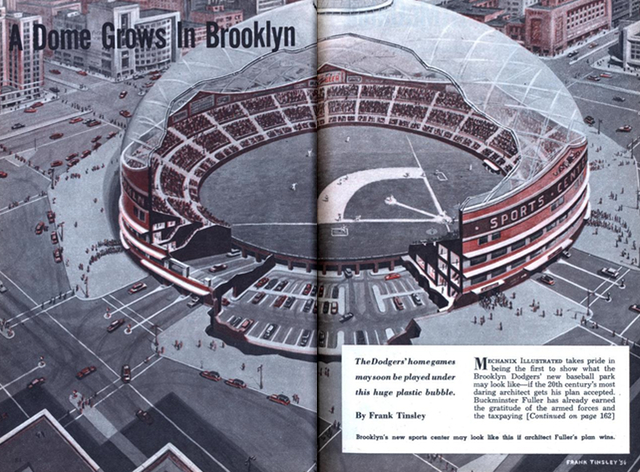 We talked with Podair about how Robert Moses stood in the way of O'Malley's Dodger Dome plans, how the fight over a Dodger Stadium in Downtown Brooklyn played out again 50 years later when the Barclays Center was built, and the role local governments should play in financing stadiums. Can you go over a little bit about what Robert Moses' role was in the way that O'Malley decided to leave Brooklyn? It's hard to imagine one individual being so powerful in one city during one era as Robert Moses was in the 1950s during New York. He was obviously not an elected official, never elected to anything, but because of his administrative positions during the 1950s, Moses controlled what got built in New York, who built it, where it got built. When Walter O'Malley decided that he wanted to build a new stadium in Brooklyn, one that he would own, he realized very quickly that while he had the finances to build the stadium on his own, he didn't have the finances to get the land. The land would be very expensive and certainly very expensive in Brooklyn. He set his sights on a property at the intersection of Atlantic and Flatbush Avenues in Brooklyn, where ironically, around where the Barclays Center stands today. He asked Robert Moses to condemn the land under a provision of a federal act called the Federal Housing Act of 1949, whereby governments could condemn land, blighted or slum properties they would designate them as. They would buy them and then sell them sometimes to private owners, but sometimes to public agencies to build projects that were associated with a public purpose. In other words a school or a hospital or a highway. Moses says to O'Malley, "I don't think that a privately owned ballpark fulfills a public purpose at all, and I'm not going to use Title I [of the Federal Housing Act] to get you this land. If you want the land, buy it like everybody else would." Now that practically was impossible for O'Malley, because he had tipped his hand. Everybody knew that the Atlantic-Flatbush site was what he wanted. It was going to be almost impossible for him to put together the capital to basically buy a lot of different parcels of land and put them together into the site for the stadium. About 40 years earlier, Charles Ebbet, who owned the Brooklyn Dodgers in the early part of the 20th Century had very quietly and secretly bought up land around what would become Ebbets Field. He was able to pull that off because before the people who sold him the land knew what was going on, Ebbets had gotten the land at a reasonable price and assembled his parcel and built Ebbets Field. That was going to be impossible for O'Malley in the 1950s. I think it's pretty clear, at least to me, that Robert Moses' intransigence on this issue made it really impossible for O'Malley to build the ballpark that he wanted to build in Brooklyn. Of course, you could argue and say, "Well, what about a city-owned stadium? Why did O'Malley have to have a privately owned stadium?" That's almost asking O'Malley to be someone that he was not. I think historians have to take their subjects on their own terms. O'Malley insisted that he wanted to own his own stadium. He did not want to be a renter in a city-owned stadium. Businessmen like to own, they don't like to rent. When the site in Queens which became Shea Stadium was offered to O'Malley as a city-owned stadium, he turned it down. What he said at the time, I thought was interesting. He said, "Well first of all, I want to be in Brooklyn. These are the Brooklyn Dodgers. If I'm going to be outside Brooklyn, I could be 30 miles outside of Brooklyn or I could be 3,000 miles outside of Brooklyn and it's not going to matter to me." What he was saying there was he was open to overtures from other cities and specifically, from Los Angeles. So O'Malley didn't really want to leave Brooklyn? After about 10 years of trying to get the land on which he could build his own stadium in Brooklyn, O'Malley turned toward Los Angeles, I think rather reluctantly. I know the urban legend in New York is that he had planned to move to L.A. all along. I didn't see that from my research. He seemed to be remarkably unfamiliar with Los Angeles. By my estimation, he had only visited Los Angeles three times in his life, for about 10 days total, when he made the decision to move the Dodgers in October 1957. It seems to me that if he had been planning to do this all along, he would have done more homework on it. I think he turned to Los Angeles reluctantly because he just felt he could not get the deal he wanted in New York. The other aspect of it that struck me is that O'Malley was a true New Yorker. As one myself, I know the attitude of most New Yorkers, which is that New York is the greatest place in the world, it's the only place in the world, and it towers over all other cities and why would anyone want to leave the greatest place in the world? I think O'Malley had that attitude as a very proud New Yorker. He moved to Los Angeles I think with regret and with some concern. I think it's pretty clear that if Moses had offered him the deal that he wanted, he wouldn't have thought twice about Los Angeles. Or if someone else in city government had offered him a palatable deal, he would not have thought about Los Angeles. Was there any other deal on the table? At the very, very end of this process in September of 1957, just weeks before the Dodgers announced that they're leaving for Los Angeles, Nelson Rockefeller, of all people, comes forward with a possible deal to buy the property at Atlantic and Flatbush, lease it to O'Malley rent-free for 20 years, after which O'Malley would buy the property and he could build the stadium in the mean time. That deal, I thought, had at least the seeds of keeping the Dodgers in Brooklyn. It broke down over Rockefeller not wanting to put as much of his own money into the deal as the city required, basically. He was a couple of million short. He just wouldn't go any farther in terms of the money that he was going to put in, and the city was going to have to pay for the rest, or O'Malley was going to have to pay for the rest. The deal broke down not over philosophy, which is how the Moses part of the deal broke down. This Rockefeller deal broke down over money. I found that to be ironic because if Nelson Rockefeller had plenty of anything, it was plenty of money. The deal broke down with weeks to go before O'Malley made the decision. I think that was the last realistic chance to keep them in Brooklyn. O'Malley was a little bit suspicious about Rockefeller because he saw it as maybe just this rich guy trying to look good before he ran for public office. Oh, absolutely. I mean it was really transparent I think on the part of Rockefeller. Here it is, it's 1957. Rockefeller has never run for public office before, he's almost 50 years old, he obviously has his eye on the Governor's mansion in 1958, and perhaps other things beyond that as we later discovered. He needs to make some sort of splash. Rockefeller had absolutely no interest in spectator sports. I mean he was not doing this because he was a loyal Brooklyn Dodger fan, because he loved the team. He just figured he could make some sort of political splash before what looked to be a very difficult race in 1958 against Averell Harriman, who was the reasonably popular Democratic sitting governor. In fact, he did do so, but as we look back at that retrospectively, that 1958 election was not a done deal by any stretch of the imagination. Rockefeller needed to get his name in the papers and what better way to do it than to save a beloved baseball team? Do you get the sense that he would have gone all the way? Was it a true publicity stunt, or was it a thing where there was a chance that maybe O'Malley, Moses, or somebody could have said, "Look, just, you have all the money in the world, what's another couple million? "Right, but from knowing what I do about Nelson Rockefeller, that kind of argument I don't think worked on the Rockefellers, generally. There's an assumption that you have all the money in the world, and they probably did, but they didn't like to be told that. What Rockefeller did is he upped the ante at one point. I think his original offer was $2 million. Now this sounds like nothing in today's money obviously, $2 or $3 million, and the Atlantic-Flatbush property was valued at maybe $8 to $10 million. When Rockefeller was pushed, he said, "All right, I'll throw in an extra million." I think now he's up to three million, but O'Malley still needed eight or nine million for it. The rest of that money was either going to have to come from O'Malley or the city, and of course then Moses steps in and says, "We're not going to spend that money, it's just too expensive." O'Malley didn't have that kind of money. We think our sports owner or sports team owners have so much money that they can do anything they want, and that's not always the case. What I write in my book is that there were maybe 10 people individually in New York who could have, out of their own pockets in 1957, just said, "All right, I'm going to buy up this Atlantic-Flatbush property. I'm just going to write a check because I can." Very few people in New York could have done that. O'Malley, who was not independently wealthy, was not one of those people. He was a wealthy lawyer, but he had made money as a lawyer, ended up buying the Dodgers and then buying controlling interest in the Dodgers. That was his main way of making money. He wasn't, for example, Phil Wrigley of the Chicago Cubs who made his money in chewing gum, or Robert Carpenter who owned the Philadelphia Phillies at the time and was an heir to the DuPont fortune. O'Malley wasn't in that position. When you say, "Well you've got to come up with $6 million or $7 million," to O'Malley, that's serious money at the time and he's not in a position to come up with that money. I don't even know whether a bank would have been willing to give him that kind of money at the time. He was essentially stuck in October 1957, unless he wanted to play in what became Shea Stadium. He just did not want to do that and so the whole deal broke down. Rockefeller was elected Governor, anyway. So going back Robert Moses, can you go a little more into how he didn't see a new baseball stadium as a public good, what his view on that was? It couldn't just be that he hated baseball. I found that almost humorous, as well. You know, there's a law that we're all familiar with called Murphy's Law where everything that can go wrong will go wrong at the worst possible time. It would be O'Malley's luck that the guy who held his fate in his hands basically, was someone who considered baseball and all other spectator sports to be a total waste of time. Moses was a very, I think you could call him a culturally snobby man. A very imperious, arrogant man. He viewed baseball as sport for the rubes. He didn't view it as anything approaching a public purpose. When you asked him, "What kind of sports do you believe in?" It's tennis and hiking and climbing and all sorts of participatory sports. I guess it stood him in good stead since Moses lived into his 90s, but it didn't help Walter O'Malley because I would be willing to argue that if Robert Moses happened to be a big baseball fan, this deal would have happened. Moses had the kind of ego where he just generalizes from his own feelings outward to the situations he encountered. Moses never considered, "Well I might not be a baseball fan but there are millions of them there, and they do have money to spend, and a stadium in downtown Brooklyn could be a very good thing for the borough and generate revenue. Even though I am not a fan, there are many other fans, I'm sure] "I don't think Moses's mind worked that way. I think he thought what he thought and when he thought it, he thought it was right for everyone. O'Malley had a very, very difficult adversary in Moses. I also noticed that there was almost like a dichotomy between Moses and O'Malley in terms of their background and their outlook and their personalities. Moses, although he was born Jewish, identified as a Protestant, as a High Protestant. O'Malley was an Irish Catholic. Moses came out of the progressive tradition in New York City. The good government tradition. O'Malley was associated with Tammany Hall. His father had been closely associated with Tammany Hall. O'Malley was while certainly not boss-ridden or anything, was comfortable in the milieu of Democratic politics in New York City. That brought him into conflict politically with someone like Moses. They were sort of on the opposite sides of almost every street. Cultural, religious, political. I think it was almost inevitable that they would not find a way to meet the minds. O'Malley was a businessman and he never made any apologies for that. Moses always portrayed himself as someone who was above mere business, who had the interests of the city and all the people of the city at heart and was public spirited and not grubby and selfish. I think Moses had a tremendous amount of contempt for businessmen generally, even though Moses himself in his own way was a businessman. You can be a businessman and still operate in the public realm, and I think Moses proved that. The way that he looked at the world and looked at things, where he himself didn't take graft, but he certainly worked with people who were more than happy to participate in it. Oh, absolutely. He knew that, but he himself put himself in another realm. What also helped Moses during the '50s is he got really great newspaper coverage from the newspapers that mattered with intelligent people and people who read, literate people. That of course is the New York Times, also, at the time, the New York Herald Tribune, which was also what we might consider today, a high-brow paper. Moses was the darling of the editorial writers of those papers because they were very public spirited themselves, and were hostile to political machines like the Tammany machine. Moses was a perfect acolyte to them. They could write great things about Moses and Moses cultivated the high newspapers like the Times and the Herald Tribune. He had an advantage in that way, as well. O'Malley was not a New York Times or Herald Tribune person. The Dodgers' paper was the Daily News and the Daily News is not the New York Times. Although often I enjoy reading the Daily News, especially the sports section more than the Times, but that's neither here nor there. I think if you're a New York sports fan, you've got to read the tabloids, you've got to read the Post and you've got to read the Daily News, whatever your political opinions are. And of course, Moses did do things that benefited private developers in ways that didn't always serve the public. But was he right to say, "This is not a public good, so I'm not going to use Title I, I'm not going to eminent domain everything to benefit you, Walter O'Malley? "It's interesting because the same exact issue came up in California when O'Malley moved to Los Angeles. The courts in California, and I think it's fair to say the people in California or at least in Los Angeles, answered it in a different way. The California Supreme Court in 1959 was presented with a taxpayer lawsuit against Dodger Stadium to stop the city transaction from going through. What happened in Los Angeles is O'Malley traded land that he already owned, a small stadium called Wrigley Field. Long story, it's in L.A., but he called it Wrigley Field. O'Malley owned that stadium and that land, and he transferred it to the city in exchange for the Chavez Ravine land. It was more of a land swap than a monetary deal. Even that was too much for some taxpayers who sued to prevent this deal. The case goes all the way to the California Supreme Court and what they rule is that the Dodger Stadium has a public purpose because the city stands to benefit. They get other land, not Chavez Ravine but other land on which they can build recreational facilities for the children of the city, and also they're going to be getting property taxes because Dodger Stadium as a privately owned property will remain on the tax rolls, so they're going to get tax money, which they wouldn't have gotten with a publicly owned stadium. Then, they're going to get all these ancillary revenues. Ticket sales and restaurants and fans spending money outside the stadium, and jobs connected with the stadium. What the California Supreme Court concentrated on is the benefit to come to the city from the stadium, and not really how much money O'Malley was going to make. In New York, the emphasis was exactly the reverse. There was very little discussion about what New York City was going to get out of a new privately owned Dodger Stadium, and most of the talk was, "Well, O'Malley will make all this money." I think what happened in New York and in Los Angeles was different answers to the same question. Different kinds of people are making those choices in New York and Los Angeles. In New York, even though it wasn't litigated, obviously, it was Moses who made this decision, Moses said, "This stadium is not a public purpose. All it's going to do is make money for O'Malley." In Los Angeles, there was a referendum that narrowly passed approving the stadium, and the California Supreme Court case upheld it. So there they said that due to the revenues that the city is going to make, and the land that the city is going to get from this transaction, and the property tax that they're going to get from this transaction, Dodger Stadium does satisfy a public purpose even though it's privately owned. Do you see any parallels between O'Malley's Brooklyn fight and many years later, the Barclays Center fight? I am, actually because I'm not only a New Yorker, I'm one of the very few people who can say that I have been a Nets basketball fan since the team was founded in 1967. There are very few people who can say that. That's a lot of suffering over the years. I still haven't gotten over losing Julius Irving in the 1970s, that just broke my heart. 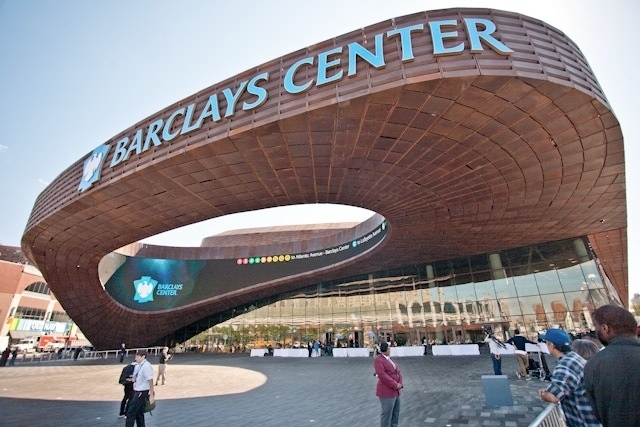 I did follow the negotiations, the very contentious negotiations over the Barclays Center. Bruce Ratner certainly got aid from the government in acquiring this land, and I'm sure somewhere in Los Angeles, perhaps the O'Malley heirs were saying to themselves, "My God, why didn't we get this kind of help in the 1950s? We'd still be there." There's a certain irony that the city of New York or the government generally, was willing to do things for Bruce Ratner that they were not willing to do 50 years earlier for Walter O'Malley. Do you think that what happened in Los Angeles had an impact outside of the city in regards to stadium financing? Do you think that played a part that, or it was just that the world had moved on from Robert Moses and the world had moved into a different way of looking at how the government helps private enterprise? Yeah, I think both. First, I think there was just regret. New Yorkers can say all they want, "Oh let them leave, we didn't need the Dodgers." Once they left though, they understood that there was a void in the city. Looking at the success that the team had in Los Angeles with a privately owned stadium, I think that made an impact on New York. When Bruce Ratner came along basically asking for help for the same property that O'Malley was turned down on, I think it was easier for him to convince city officials. You're also right in that I think the atmosphere changed generally in the country in terms of public entities giving help to private individuals and private sports owners in order to keep them. I think the wind shifted to an extent. Third, as you also mentioned, I think New York had a Robert Moses hangover for a long time after that. I think, you know very few books of history have had the impact that Robert Caro's The Power Broker had. Often, books of history, other historians read them or interested readers read them, but I think public officials were reading The Power Broker and they realized that to give one individual who wasn't even elected, that kind of power over the built environment of the city, was a mistake. Do you also see a parallel in how Dodger Stadium was built, and then downtown Los Angeles would develop, and the Barclays Center was one part of what has become an enormous change in downtown Brooklyn where you've got high-rises and more luxury retail going up? Absolutely. I think there's certainly a parallel there. Recently, I was in New York to give a talk at the Brooklyn Historical Society. I hadn't been in Brooklyn in a while. I was struck by how unrecognizable it was almost from just maybe even a decade earlier. All this high-rise development, apartments, it looked like a different place. What happened in Los Angeles as a result of Dodger Stadium was that a music center was built, an indoor sports arena was built, the Staples Center, art museums, restaurants, and high-rise apartments were built in what had pretty much been what I call a, "work and flee zone," in downtown Los Angeles up until the 1960s and 1970s. I think that made an impression on Brooklyn public officials. Not necessarily Manhattan public officials because Manhattan didn't need any help or advice from downtown Los Angeles. I obviously don't know Brooklyn public officials personally, so I don't know what they were thinking of, but they had to have said well we lost the Dodgers 50 years go, where did they go? They went to Los Angeles and what happened to downtown Los Angeles after Dodger Stadium was built? Obviously though there are all sorts of social, racial costs, economic costs to what's happening in downtown Brooklyn. It's not just a one-sided argument here. What they're thinking is well, if we can get at least some of these things that downtown Los Angeles has in downtown Brooklyn in this area, then the Barclays Center will have fulfilled its purpose. I have to believe that was going through their minds. There was something that you wrote that was really interesting in the book about how O'Malley wanted to make Dodger Stadium class inclusive while also getting celebrities involved in games. Have modern stadiums totally failed on that level? We've seen with the new Yankee Stadium and their moat separating the really high rollers from everybody else, and every new stadium has more and more luxury boxes. Is that kind of an unintended consequence from O'Malley Hollywooding things up a little bit, or is this just again, another thing where society kind of shifted and so that's what happened? I think O'Malley was a businessman, and a businessman wants his stands full. O'Malley understood that in this new Los Angeles market that he was going to have to do two things at once. First of all, he was going to have to sort of glamorize it up and Hollywood it up to get the Hollywood stars to come to the games and give them good seats. He became very good friends with of all people, Cary Grant, who was not even an American, he was British, who became a very, very big baseball fan and sat with O'Malley in his box and was seen in the stadium club and everything. That's one side of what O'Malley knew he had to do. He had to involve Hollywood because L.A. is a city built on glamor. He also knew that the vast majority of average Angelinos were not Hollywood types, and there were many, many more of them. In other words, if he filled his stadium up with all the Hollywood types that he could find, he would only probably sell about 5,000 tickets. There had to be more to it than that. What he was able to very skillfully do was to market the team in two ways at once, as a glamorous sort of place to be, and also as a place that was inexpensive for families. His ticket structure, $3.50, $2.50, $1.50 for around the first 15 years, well into the '70s, was designed to attract families and repeat viewers. These families would be attracted by the atmosphere of the stadium, of course by the low ticket prices, and also to an extent, by the perhaps opportunity to see a Cary Grant or Frank Sinatra in the stands. Of course they're sitting in the front row, in boxes, or private clubs, but you know, you never know who you're going to run into. What O'Malley was doing in Los Angeles is he was sort of working both sides and I think very skillfully. He was glamorizing the team but he was also not pricing the team out of affordability for the average Angelino. He was able to do both things at the same time. Now, O'Malley did not have to really deal with the era of free agency in baseball. The 1976 advent of free agency came in at the very end of his career as owner, he died in 1979. Obviously, owners today deal in a completely different world financially. Players are making huge amounts of money and so the owners need revenue streams to make up for that and other expenses. We see the total glamorization of these teams where it's only the rich people or mostly the rich people and the well connected people who get to go to the games. I mean at this point, even the low tickets, the low price tickets at Citi Field and especially Yankee Stadium, are still pretty high. I don't think that O'Malley would have approved of what he saw. Although he might have said well listen, this is the bottom line. The bottom line is that my total salary expenses because I didn't have to deal with free agency were, I don't know, $5 million, and the equivalent today is, the same team, the same 25 guys' salaries, is the equivalent of let's say $50 million. Obviously the value of money changes. It's 10 times as much. Salaries are costing owners 10 times as much and I think that explains a lot of the ticket prices. It doesn't make it acceptable, because today I did some research. To go to a Dodger game, let's say against the San Francisco Giants and sit in a $3.50 box seat, what used to be a $3.50 box seat at Dodger Stadium, that could cost you as much as $300 or $400 today. There's the law in history of unintended consequences. You make a decision 50 years in the past, and you have no idea how it's going to work out. I don't think O'Malley could have predicted that when he invited Cary Grant to come to a Dodger game and have the people in the stands see Cary Grant, that he may have started sort of a chain reaction which has ended here, where if you watch a game on TV the seats in Yankee Stadium behind the plate are always empty because they cost $1,000 or something like that. Just to wind things up, going back to an op-ed you wrote about this, the day is probably coming that a New York owner will say, "This is obsolete, I need a new place." So what is the ideal way to finance a stadium? Should governments support their construction at all? What's the best way forward, in your opinion? In my view, the best way, the ideal way is to have a private owner buy the land and build the stadium. Now, not every owner is wealthy enough to do that, but and I think the op-ed that you read discussed what went on in Los Angeles with Stan Kroenke, the owner of the Los Angeles Rams, previously the St. Louis Rams, who's a Walmart fortune heir, he's got a lot of money. He bought all the land that he wanted in Inglewood, California, which is sort of surrounded by Los Angeles, and constructed his own stadium on his own land. Los Angeles was of course very happy because they didn't have to put in anything, and they're going to get all this property tax and they don't have to build a stadium that they can't pay off. That is the perfect situation where an incredibly wealthy private owner will do that. Now obviously, that's not going to be the case in every city in every stadium. New York, I think has more of a chance of having that happen simply because the owners want to be in New York. In other words, Stan Kroenke was, it seemed to me, desperate to get out of St. Louis, and get to Los Angeles. To get to Los Angeles, he was willing to open his own pockets and pay money. Not every city is able to have that kind of leverage, but I think New York does have that kind of leverage. It can say to an incredibly wealthy owner, "Okay, you want to buy in? Buy in. Use your own money, and you will have the advantage of owning a team in New York." Private money is the best. Now, short of that, obviously the public money has to be used. I think the Dodger Stadium model is best where if you're the government, you try to help the private owner with the land. The land sometimes is the real sticking point. If you can help the owner with the land, you can then say, "Okay, we helped you with the land, now build the stadium on your own." If you build the stadium on your own, it's going to be a property tax generator. That way, I think you can sell that to the public on that, on those grounds. Generally, get as much private money as possible, try to get someone as rich as Stan Kroenke to invest in New York in that way. Short of that, help on the land, and I would draw the line there. I would say, "Okay, we will help you on the land, the rest of it has got to be up to you. We cannot start throwing money in for the arena itself or the stadium itself." I think that may be asking too much, especially since we have so many needs obviously in our society, and so many needs in New York. The optics I think are going to be bad if you go beyond, "We will help you with the land." And you know what? My feeling is if an owner is helped with the land by the government, if he then says, "Well I don't have enough money to build the stadium," the response is, "Well, you probably shouldn't be in this business, then."